Tattoo Removal and laser Tattoo Removal:- For those looking towards tattoo removal options in Bangalore, Xtreme is that the ideal place for seeking professional help. Getting tattoos done is one trend that has been on the increase throughout the last few years however it should happen that one fine morning you no longer feel like having it and wish to get it removed. Removal of tattoo has been always painful as getting it done. For the removal of tattoos are many ways through that tattoo removal is performed upon, causing a lot of pain and inconvenience. And there are instances wherever removal does not happen effectively in-spite of pain. For people in Bangalore, it’s necessary to notice that if you’re so opting for tattoo removal you should be getting it done in a reliable and professional clinic. Traveling to different places like Chennai may help but one cannot keep traveling for such a procedure as it could take multiple sessions for tattoo removal. Well, you need not worry about the tattoo removal in Namma Bengaluru has one place wherever tattoo removal can happen in a convenient and really efficient manner. So, Welcome to Xtreme Tattoos. Tattoo Removal and laser Tattoo Removal: – There are times after you get a tattoo done without giving it a lot of thought and once you have got it inked you start feeling that it does not match your personality or is not “the right thing” for you. Generally it would so happen that the tattoo artist can a nasty job out of it and you not would like it. In cases like these, the laser tattoo removal procedure is helpful as a result of it helps you get eliminate the ink from your body. Let’s take a look at the procedure, its value and aspect effects. We are into xtremetattoos having multiple branches in Bangalore, No #1 Best Tattoos Removal in Bangalore, we adopted into advanced technologies for removal of tattoos like laser and lots of additional Before the laser tattoo removal technique came into image, tattoos were removed by sanding the area or removal. Another methodology used was in operation the tattooed skin and using a skin from another area to exchange the skin. However, with the arrival of the laser technology, tattoo removal has become easier to perform. How laser Tattoo Removal works? In the laser tattoo removal procedure, your tattooed skin is subjected to a laser beam that breaks down the pigments of colors from your tattoo and removes them off the surface of the skin. Procedure of laser Tattoo Removal: Before the procedure, your skin is evaluated to look at what are the colors that are present in your tattoo and what reasonably laser beams you’d wish. You may be given a local or administered anesthesia to reduce the pain. You’ll even be given a protecting ocular to protect your eyes. 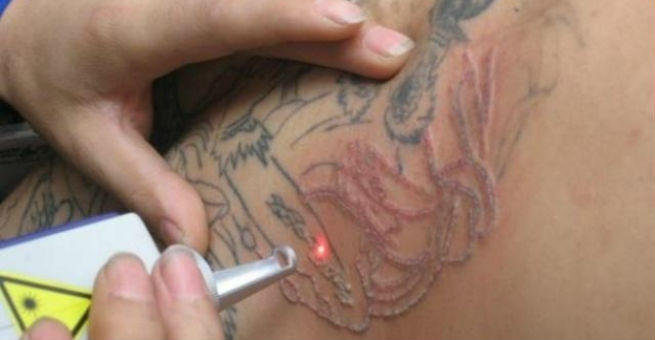 The removal technique involves placing a laser emitting handheld device on the surface of your skin. The laser beam targets the colored pigments while not moving the skin around it. The procedure makes use of targeted beams of varied wavelengths for various colored pigments. The laser breaks down the pigments in the tattoo into minute particles. Then your system kicks in and removes the pigment from your body. However, one sitting isn’t sufficient to get rid of the tattoo. You’d would like anywhere between 5-10 sittings for the entire removal of the tattoo. There has to be a spot of a minimum of four weeks between two sittings. Depending on the ink and also the space lined, your tattoo should be removed fully within six months to a year. The tattoo price of the laser tattoo removal will vary depending on the size of the tattoo, the pigments used and also the location. On an average, a sitting should value you. The procedure itself is extremely painful, since the laser beam creates lots of targeted heat. Even when the procedure your tattoo will feel hot and might be swollen for a couple of days. The skin that’s subjected to the laser will lose some of its natural pigments and can turn pale. There are scarring in some cases if you decide on the treated area. Sometimes you will experience blistering and infection among the house. However, with the advancements that are happening in the laser business, the side effects can be brought all the way down to minimum and the treatment can be almost problem free, we are also providing Permanent Tattoo Removal Bangalore, laser Tattoo Removal Bangalore, Tattoos Removal Bangalore. Having second thoughts about your tattoo? What may have been an enthusiastic urge to get a ‘cool’ tattoo, now maybe bothers many that want to induce their inked body parts clear once more. And with advanced laser technology in our tattoo removal clinic in Bangalore, any tattoo is often safely removed, let alone no scars whatsoever.How is a tattoo removed? Thanks to dermatology laser technology, the tattoos are created faint or are fully removed. The laser light is geared toward the ink particles of the tattoo, that are disintegrating, to be purged from the body through its natural detoxification system. The method takes place over a period of weeks, with sizable ink particles requiring additional treatments. The treated skin scabs over and over a period of days, falls, taking the ink away with it. Are the tattoo removal treatments painful? Our main aim, along with removing tattoos, is to make sure that that patients expertise no pain at all. Our doctor for laser tattoo removal in Bangalore, suggests the use of anesthesia. However, several treatments don’t necessitate the employment of it. How many treatments are required? The time and number of treatments needed varies based mostly upon the size, color, depth and location of the tattoo. After every treatment, patients can notice their tattoos fading. Also, the method covers an amount of your time, with a spot of four to eight weeks between each treatment. Though treatment is guaranteed to remove tattoos, the amount of sessions each person needs varies from the kind of tattoo they need on their bodies. For instance, tattoos administered by professional artists are additional deeply embedded, and require multiple treatment sessions to attain best results. What will my skin look like when treatment? A white discoloration over the tattoo, and inflammation around the skin are observed following treatment. Aquaphor ointment and gauze would be administered to the treated skin after the process, which is to be left overnight. Are there any side effects? A laser tattoo removal may, in rare cases, result in discoloration of the skin, loss of traditional skin color or its whitening. In case of its occurrence, the skin normally heals itself and returns to its natural color, within three months. However, only partial removal of tattoos may happen for a few patients, as the ink used for tattooing is not supervised. If you’re probing for reliable and reasonable tattoo removal clinics in Bangalore, then you’ve landed on the proper page. Xtreme may be a skin care clinic based mostly in Bangalore. We offer a good variety of medical and cosmetic skin care services. Our luxurious clinic offers a clean and comfortable environment for you to possess your laser tattoo removal treatment. We build use of the latest equipment and also the most advanced technologies to produce the simplest laser tattoo removal in Bangalore. Laser tattoo removal in Bangalore: At Xtreme, Bangalore, we provide professional services for laser tattoo removal in Bangalore. We all know that secondary infections could arise once the tattoo is being removed. That’s why we take all the care to make sure that the treatment area is hygienic and also the equipment is sterilized so there’s no reason for infection. We have extremely skilled technicians and expert dermatologists on our workers roll. After you found out an appointment with us, we will have a pre-treatment consultation with you to know your preferences and needs. Our specialists also will provide you with various suggestions for laser tattoo removal based on your preferences, tattoo size and color. Depending on the shape, size, and color of the tattoo, the number of sittings is determined. Our laser treatment in Bangalore is done at lowest value with advanced and approved instruments. We take pride in the quality of treatment we provide. Our trained professionals who form our team are extremely experienced and leave no stone unturned to provide you what’s best suitable for you, so creating us one of the best tattoo removal clinics in Bangalore. So, if you are looking for laser tattoo removal in Bangalore, Xtreme has been just a call away. Book a fast appointment with us today.